The Dallas Texans opened the 1962 American Football League season on September 8, hosting the Boston Patriots. Owned by league founder Lamar Hunt and coached by Hank Stram, the Texans finished second in the Western Division in each of the AFL’s first two campaigns, most recently posting a disappointing 6-8 record in ’61. Dynamic all-purpose HB Abner Haynes (pictured above) was the star on offense, with FB Jack Spikes providing solid power running when healthy, and the defense was effective, especially at linebacker. The big change for ’62 was at quarterback, where veteran Cotton Davidson had been found wanting and was being replaced by Len Dawson, an ex-Purdue star who had been a disappointment in the NFL. Under the tutelage of Stram, who had been Dawson’s backfield coach in college, it was hoped that he would provide the necessary upgrade. Boston was coming off of a 9-4-1 record the previous year. The Patriots played their best after Mike Holovak was promoted to head coach during the season and he remained at the helm. 32-year-old QB Babe Parilli, who had split time with Butch Songin in 1961, now had the starting job to himself and there was talent around him on offense, including flanker Gino Cappelletti, a reliable, if not speedy, receiver who was also a productive placekicker. There were 32,000 fans in attendance for the Saturday night game at the Cotton Bowl. The teams traded punts until late in the opening period, when the Texans put together a long drive of 86 yards in 15 plays that stretched into the second quarter. Len Dawson converted a third-and-six situation with a pass to TE Fred Arbanas for 25 yards and Abner Haynes and Jack Spikes ran effectively. Haynes finished the series off with a dive into the end zone from two yards out for a touchdown and Tom Pennington added the extra point. The Patriots responded with a seven-play, 70-yard possession. 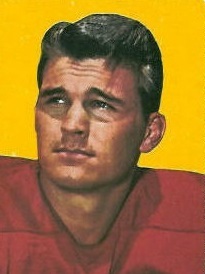 Babe Parilli threw to split end Jim Colclough for 13 yards on a third-and-ten play and connected with FB Larry Garron for 22 yards to the Dallas 35. A 19-yard run by Garron had ten more yards tacked on due to a roughness penalty called on the Texans and two plays later Parilli passed to TE Tony Romeo (pictured at right) for an 11-yard TD. Gino Cappelletti kicked the point after to tie the score at 7-7. DB Dave Grayson returned the ensuing kickoff 41 yards to the Boston 49. Haynes gained 11 yards on two carries to start the series and a pass interference penalty picked up ten more yards. A running play was followed by a Dawson pass to split end Chris Burford for 21 yards and two plays later Dawson found Burford again in the corner of the end zone for a five-yard touchdown. Pennington converted and the Texans were back in front by 14-7. Following a punt by the Patriots, Dallas put together an 82-yard scoring drive in just five plays. Dawson, forced to scramble, ran for 14 yards and HB Frank Jackson (pictured at right) gained 35 yards, showing off good moves in the open field. After an incomplete pass and delay of game penalty, Jackson rushed for another 13 yards around end and Haynes gained the final 25 yards for a TD in spectacular fashion. Pennington again added the PAT and the home team extended its lead to 21-7. The Patriots got the ball back with two minutes remaining and Parilli immediately threw to Romeo for 17 yards. A defensive holding penalty advanced the ball to the Dallas 25 and, four plays later, Parilli threw to HB Ron Burton for a pickup of 12 yards to the two yard line. From there Parilli ran the rest of the way, going around end for a TD with 34 seconds left in the first half. Cappelletti added the extra point and the Dallas lead was 21-14 at halftime. Boston put together a promising drive to start the third quarter but, after reaching the Dallas 38, LB Sherrill Headrick intercepted a Parilli pass. The Texans advanced to their 28 and had to punt and the Patriots again moved the ball well, most notably on a Parilli pass to Cappelletti that gained 21 yards. However the visitors again came up empty when Garron, having grabbed a toss from Parilli in the backfield, was stuffed by Headrick for a 12-yard loss and Cappelletti’s field goal attempt from 46 yards was blocked by CB Duane Wood and recovered by the Texans at the Boston 39. Three plays later, Haynes carried 30 yards for a touchdown, Pennington converted, and instead of the Patriots possibly closing the gap, Dallas was up by 28-14. A short Boston series resulted in a punt and the Texans were driving as the game headed into the fourth quarter. A sack of Dawson put Dallas in a second-and-22 hole but a completion to Jackson for 32 yards advanced the ball to the Boston 18. The 10-play, 58-yard drive concluded with Dawson throwing to Haynes in the end zone for a nine-yard TD, his fourth of the day. Once more Pennington booted the point after and the Texans were seemingly in control by a score of 35-14. The Patriots responded with a quick tally, going 66 yards in three plays. Parilli completed passes to Colclough for 22 yards and Burton for 29, and Garron ran the last 15 yards for a touchdown. Cappelletti added the PAT to narrow the Dallas margin to 35-21. A penalty and a sack forced the Texans to have to punt from their own seven on the next series, and Boston started off with excellent field position at the Dallas 35. Parilli threw to Romeo for 32 yards and Burton ran for a three-yard TD. Cappelletti’s extra point made the game close at 35-28 with 5:25 remaining on the clock. Starting from their 19 after the ensuing kickoff, the Texans went 81 yards in nine plays to settle the issue. A 15-yard personal foul on the Patriots on a second-and-eight play helped move Dallas along, Haynes had four carries for 21 yards, and Dawson completed a pass to split end Bill Miller for 30 yards. Jackson ran for an eight-yard touchdown with 33 seconds left, Pennington kicked the point after, and Dallas won by a final score of 42-28. The Texans led in total yards (421 to 322), with 265 of that total coming on the ground, and first downs (27 to 22). Boston recorded five sacks to one by the home team, but also suffered the game’s only turnover. Both teams were penalized seven times apiece. Abner Haynes was the headliner for the Texans with 122 yards on 19 carries that included three touchdowns and three catches for 14 yards and a fourth TD. Not to be overlooked, Len Dawson had a solid performance as he completed 16 of 23 passes for 202 yards and two touchdowns with no interceptions, and also ran for 32 yards on four carries. Additionally, Frank Jackson ran for 72 yards on 9 attempts that included a TD and gained another 32 yards on his one pass reception. Bill Miller caught 6 passes for 72 yards and Chris Burford contributed 5 receptions for 59 yards and a score. For the Patriots, Babe Parilli was successful on 16 of 31 throws for 214 yards and a TD while giving up one interception. Larry Garron ran for 48 yards and a touchdown on five carries, had three catches for 18 yards, and averaged 28.0 yards on three kickoff returns. Tony Romeo (pictured at left) caught 5 passes for 84 yards and a TD. Len Dawson’s performance emboldened owner Lamar Hunt to trade former starting QB Cotton Davidson to Oakland. The vote of confidence proved to be justified as the Texans went 11-3 to top the Western Division and defeat Houston for the AFL Championship. Boston won its next three contests before dropping the rematch to Dallas. The Patriots contended in the Eastern Division, finally ending up second to the Oilers at 9-4-1. 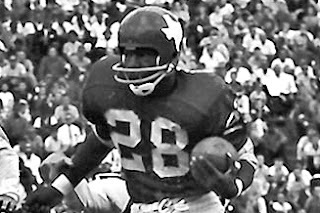 The opening-game performance by Abner Haynes launched a season in which he led the league with 19 touchdowns and finished second in rushing (1049 yards) and all-purpose yards (1768). He was a consensus All-AFL selection. Len Dawson received AFL Player of the Year honors from The Sporting News, leading the circuit in touchdown passes (29), completion percentage (61.0), yards per attempt (8.9), and overall passing (98.3 rating).